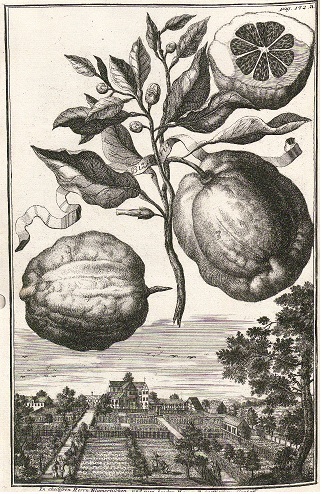 In 1708 the German merchant and botanist Johann Christoph Volkamer published four engravings with different forms of Bizzarria fruits in his wonderful book 'Nuernbergische Hesperides'. His detailed description, titeled 'About Pizaria und it's varied fruits' , based on the observation of his own plants, witch he cultivated for many years. So he realized that the branches with leaves, flowers and fruits of sour orange should not take over. They had to cut off, because otherwise the whole tree "could at last be completely transformed into a common sour orange tree." Some years later Volkamer gave an account about two Bizzarria-trees, he had planted out. The part with sour orange characteristics had become so dominand, that attemt to reduce it, let the trees go down. He came to the conclusion that Bizzarria plants should be better kept in pots. In the Latin edition of the Nuernbergic Hesperides, there is a reference to Natis's publication of 1674 in the list of the used literature. The short referencedoes not show whether Volkamer knew the whole text of Natis's work. In contrast to this he thought that the Florentine Bizzarria was artificially created by the creative ability of the gardeners. Undoubtedly Volkamer's collection of Bizzarrias was significant and outstanding, but at the beginning of the 18. century these plants had spread widely throughout Europe and grew in many botanical gardens and Baroque orangeries.